Whether it's revving up your engine to head out on a cross-country road trip or jumping on your bicycle to pick up a gallon of milk across town, transportation is an important part of life. We're kicking off a year-long celebration of all the things that get us from point A to point B this summer. 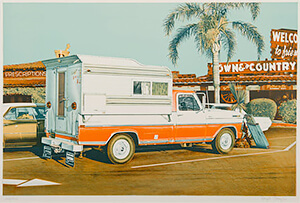 Experience transportation as muse in prints, paintings and photographs from the museum's collection including works by Tod Papageorge, O. Winston Link, Patrick Nagatani, Charles Orloff, Bea Nettles and Roger Brown. Explore engaging activities inspired by the works, such as a real train track that runs around the base of the gallery, and hear from local transportation enthusiasts in your neighborhood like the city planners and bus drivers who make this city go. In addition to the collection work on view, a sculpture by Los Angeles based artist Isla Hansen has been commissioned for this exhibition. Aeromorphiscope is an interactive, soft sculpture that asks visitors to take the controls of an anthropomorphic plane and jiggle and wiggle the passengers and crew to wake them from a deep sleep and keep the plane from plummeting down. Sound a little scary? This piece is actually fun, friendly and engaging, taking its inspiration from puppetry and cartoons.